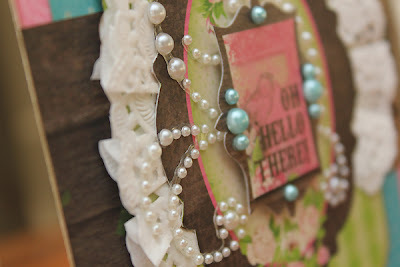 Today, I am playing along with the Bo Bunny Card Challenge and the challenge this month is for you to create a "romantic and feminine card" using whatever Bo Bunny supplies you have on hand. 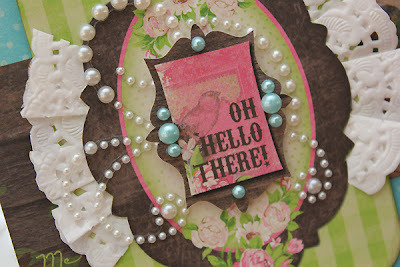 I choose to use one of my latest favorites...Prairie Chic to create my card. The label shape on the card was cut from the Flea Market Finds patterned paper. To add the doily, I cut a slit along the edge of the label shape using my craft knife . I then cut the doily in half, fan folded it and stuck it through the slit. I then added the sentiment sticker and jewels for some added bling! Thanks for stopping by tody! I hope you will join Bo Bunny and play along with this month's card challenge. I can't wait to see what you create!!! Beautiful card Juliana! I love it! Gorgeous! Love the pearls and doily! This is gorgeous Juliana! Love how you used the doily and that pretty bling! This is gorgeous! Love love love the doily and the pearls!!! It's such a gorgeous feminine card! I love it!